We are inviting you to join us from wherever you in the country and Stride for Survival! 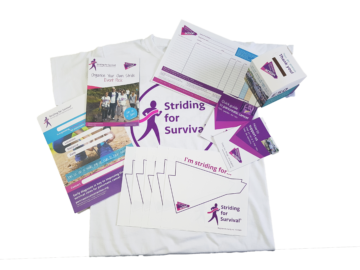 If you can’t make our Striding for Survival event this year at Virginia Water why not organise your own stride with your friends and family? This is a fantastic way to bring everyone together to raise awareness and funds for pancreatic cancer and walk in tribute for a loved one and all those affected by pancreatic cancer. We have put together lots of useful advice and tips on how to organise your own event and what to do during and after – it’s never too early to start planning your walk! We’ll be there to support you every step of the way! Risk Assessment: A risk assessment is a great document to have for your event as it helps you recognise any potential problems you may encounter. Event poster: Download extra event posters to help publicise your event. Put them in your workplace, school, local notice board, community centre or shops. We have set up an event page on JustGiving.com to make it easier to share your event with friends and family – the most popular and successful way to begin your Striding for Survival fundraising efforts. Click here to see the event page. Register for you free hosting pack today! Host t-shirt size - we will send you one free of charge! What's the URL of your fundraising page? We will use your information to provide the support and merchandise you need to help you fundraise, to administer your donations and claim Gift Aid if you sign the declaration. We will take care of your details and keep them safe. We will never share them with others for marketing or commercial purposes. Our privacy statement explains more about how we do this and your rights to access information we hold about you.